Earlier this week, we reported that Attack the Block star John Boyega was in the mix for a crucial part in Terminator: Genesis, the fifth film in that ongoing franchise. Well, he didn’t get it. But we now know who did! 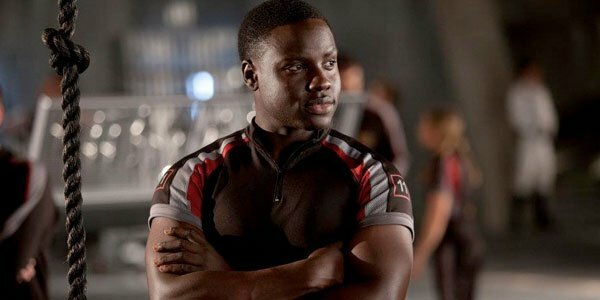 The Hunger Games co-star Dayo Okeniyi has captured the role of Miles Dyson’s son in sequel, according to Variety. Okeniyi played Thresh in the latest Hunger Games film, Catching Fire. He’ll now take his talents to a new franchise that routinely advertises itself as the first chapter in a planned trilogy. Nothing like job security in this fickle film industry. Who is Miles Dyson? You might remember, in Terminator 2: Judgment Day, that Dyson (played by Joe Morton) was the scientist who helped in the creation of Cyberdyne Systems and, eventually, SkyNet. That computer system eventually launched the war between humans and technology. And it was revealed, in T2, that the scientists used the crushed parts left behind by Arnold Schwarzenegger in the original Terminator movie to develop Cyberdyne. Time is a flat circle after all, isn’t it? There are no real details about how Dyson’s son will factor into the new story. And really, we’re completely confused by the casting of these roles now. Because Okeniyi is 25, so we’d assume that Genesis is taking place 20 years after Terminator 2 (when the Dyson child was just that… a child). But Genesis has gone ahead and cast Emilia Clarke – age 26 – as Sarah Connor. Also, Jason Clarke, age 44, will play John Connor. This makes no sense, just from a timeline point of view. Okeniyi, meanwhile, stole the show away from his two bland co-stars in the teenage romantic drama Endless Love, and appeared in both Runner, Runner and The Spectacular Now. He’s an extremely charismatic young talent who, hopefully, will be able to show some of that personality in what have become a dour series of sci-fi thrillers. Time will tell. Terminator: Genesis is aiming for a July 1, 2015 release date.